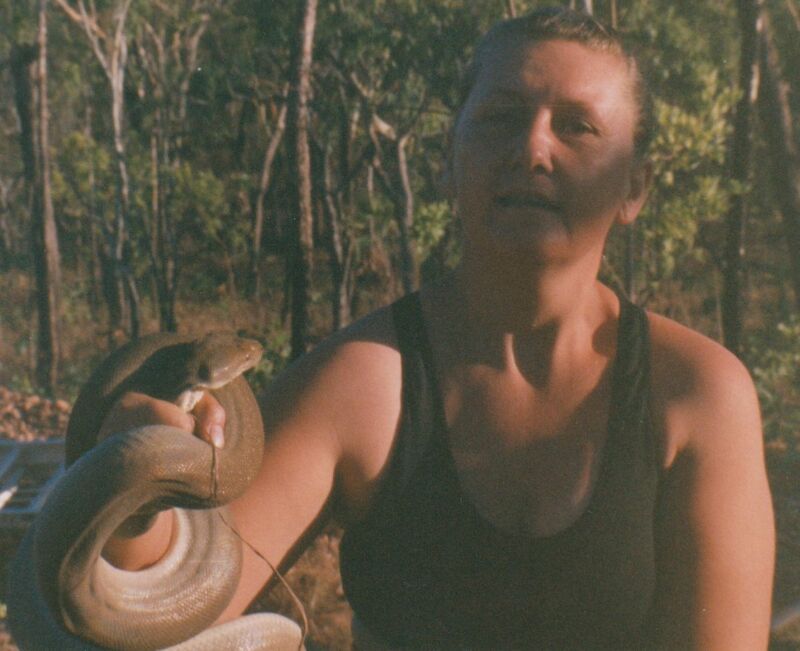 I’m not guaranteeing that these won’t show up again with the appropriate story, but having talked about snakes, I should show you snakes and these pictures are great – yes (for any newbies here), this is our 250 acres of wilderness in the Top End, Australia sixteen years ago, and yes, the woman in the latter half of the photos is me – I do hope you shy-of-snakes-type people will have a have a look, too – be brave and all that. When something like this shows up inside your living space, in this case the caravan (office space) annex, you don’t just leave it there. 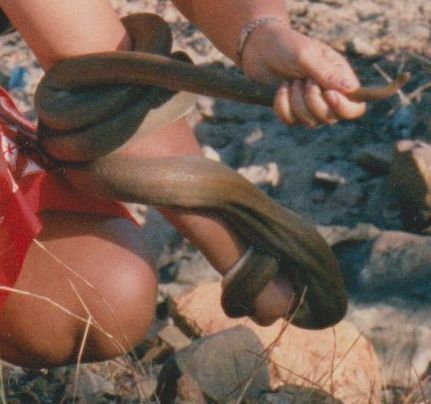 As you can see, the pythons were a decent size. There were much larger ones around, but the giant ones never tried moving into our camp. This was the first beauty to show up. I was inside the van at my desk when I heard the “ping” as the cabinet door popped open. That seemed an odd thing to happen, so I went out to investigate. 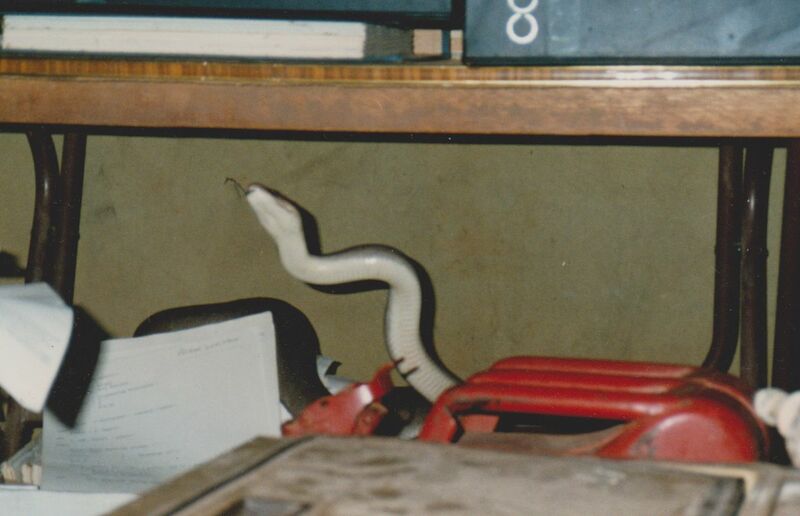 The snake had come up from underneath of the caravan, up and in through the open back of the cabinet, then pushed the door open and came over the top, then went exploring. Fortunately I had a camera ready to hand. Initially I was shy of picking them up. They are not poisonous, but they do have a nasty bite, and I have a healthy respect for life and limb, just the same as anybody else. 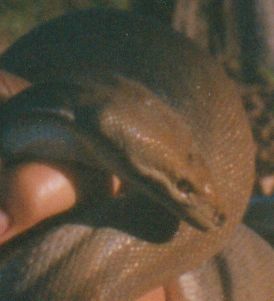 Being still new out there at that time, I also wasn’t certain that it was a python. The long and the short of it is, our closest neighbour, 3 kilometres away (nearly 2 miles) came and took it away. After seeing how it was done, I could then do it myself, and after that I became Resident Snake Catcher. Here’s a lovely close-up of that same snake. One of my favourite pictures. The next I handled myself. 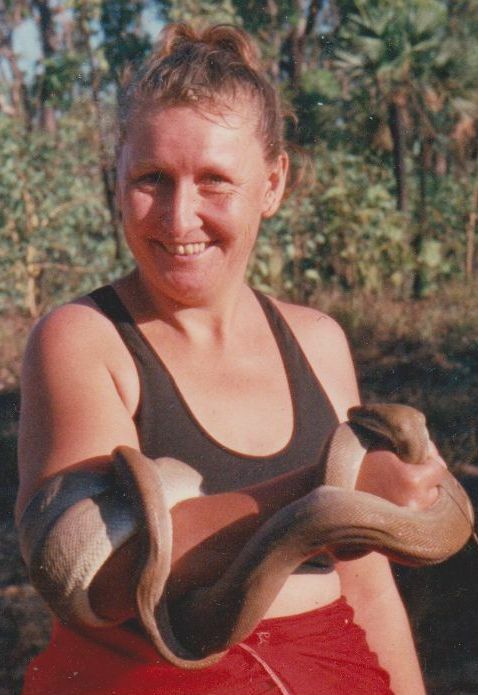 Once I’d done that, I never feared picking them up – not the pythons, anyway. 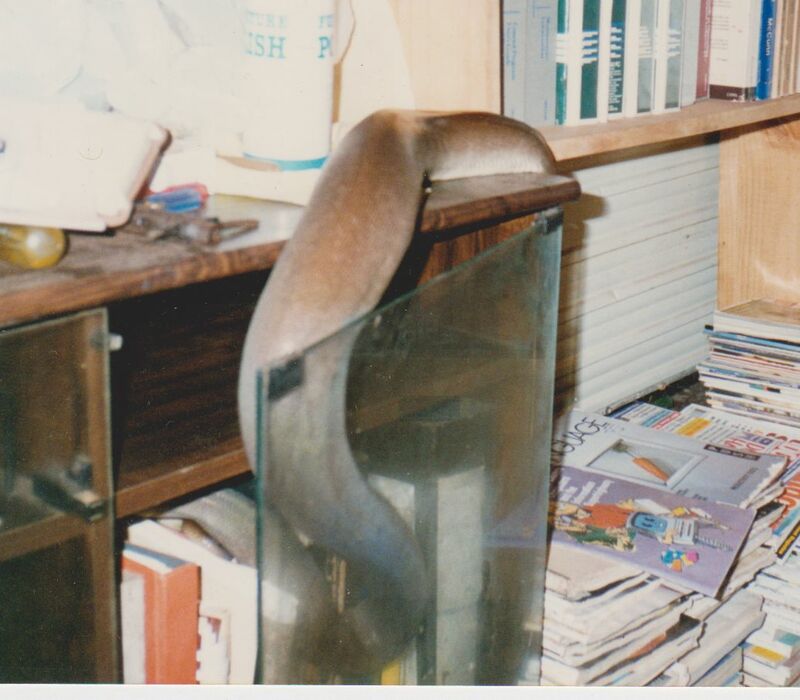 This one, like the rest, was released a few kilometres down the road. Many of the ones I dealt with myself, I did alone, which meant there was no one around to take any photos. Occasionally, though, they would turn up on the weekend when Greg was home, which is why I’m smiling in these pictures – because I actually got some pictures! 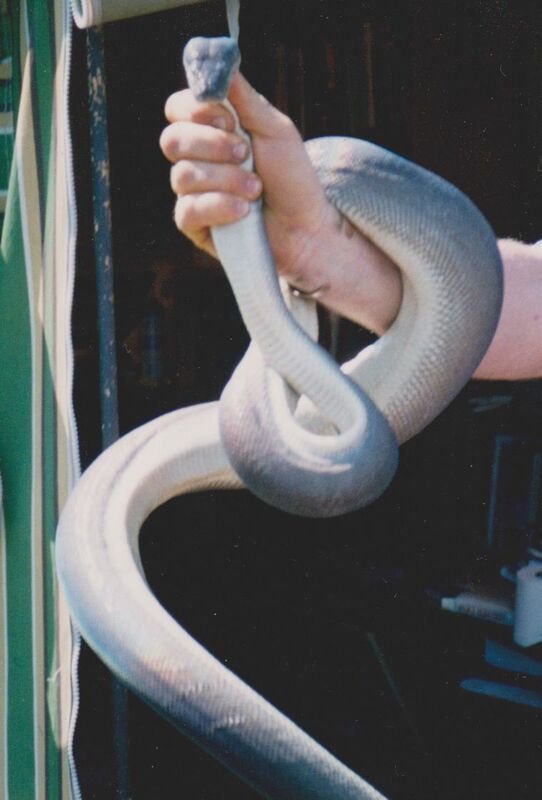 This one cut the circulation in my arm, which you can see in the reddening of forearm and hand, which unfortunately makes me look as though I’m squeezing the poor thing to death – which I am not. 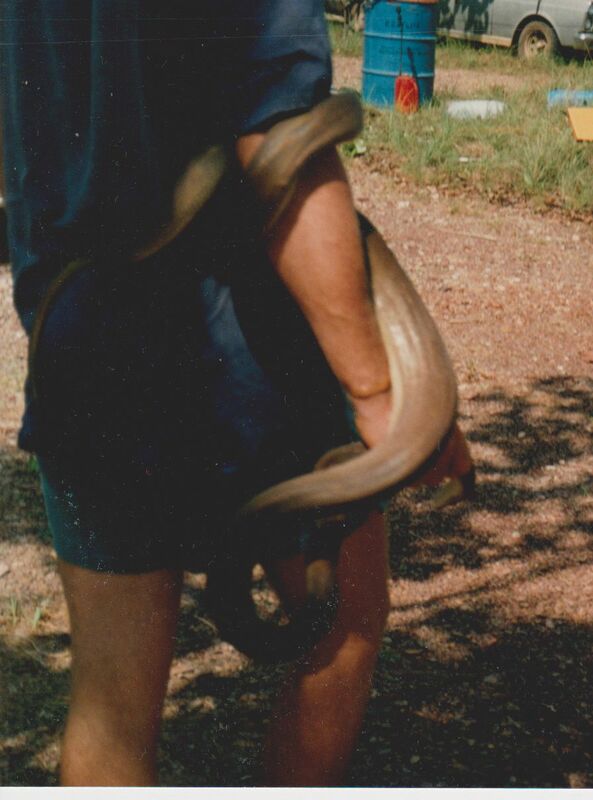 I was always very mindful that the snake I held was a living thing that I wanted to release, not harm. Here I am getting it unwrapped (above). You can see the muscular flex of it’s body. 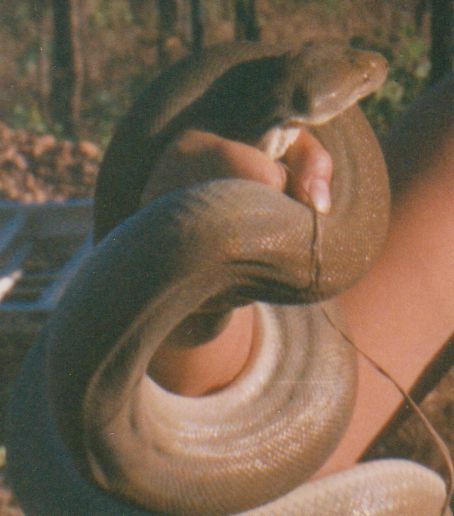 These are, of course, wild creatures and not used to being handled. So, as I was trying to deal with it, it was trying to deal with me – it was trying to choke my arm into submission and make me let go! When I finally got it off me, I held it up to show the length of it, which is the photo you saw a few days ago, but I will show here again for those who didn’t see it. 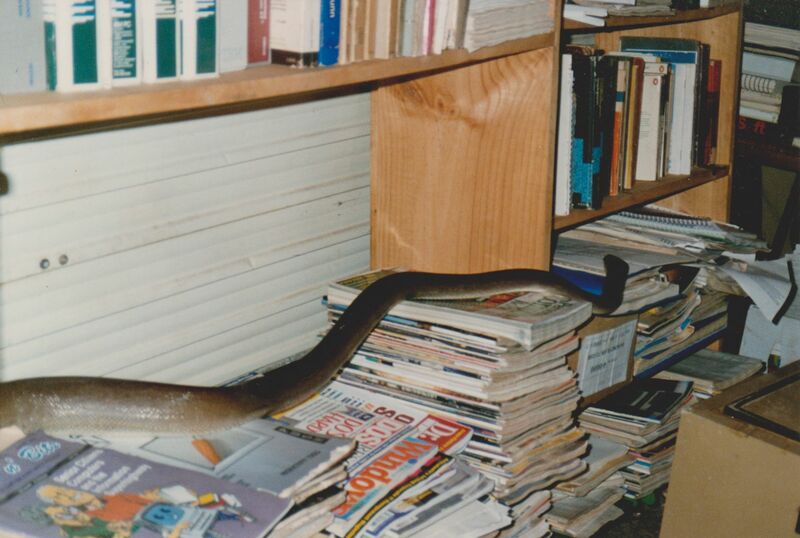 Here (below) is a different python, another lovely specimen. Thank you for letting me share these with you. They were great days. I learned a lot of valuable lessons out there, the biggest being self-confidence. Wow! That’s what I call daring! The python is quite big! I see you guys took precaution holding it by the head. 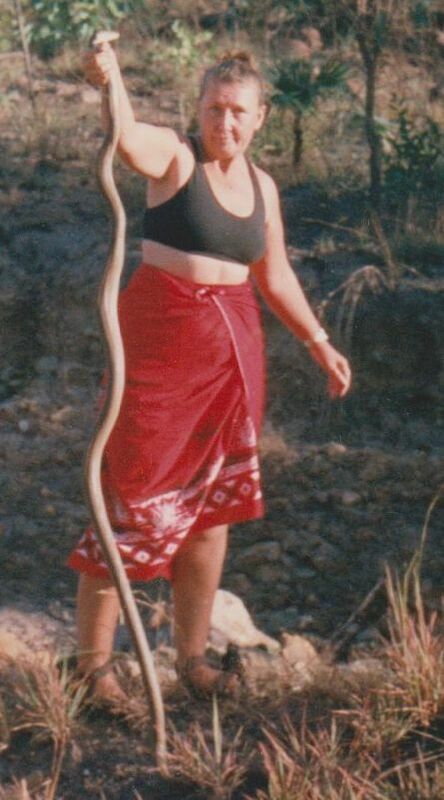 One question: how was the feel of the python against your skin. Cold or warm? Sorry — I meant to say cool. It’s the wee hours of morning 🙂 and I am trying to get some writing done before going back to bed. Just teasing. Sorry to have distracted you from your work, I hope you get done what you want to. And thank you for taking time to have a look at these photos, I’m quite pleased with them, and that means I like to share. I guess it’s almost night by you, so I wish you a wonderful sleep. Please say “hi” to Greg. He is now my Superman! Yes, I will pass on your “Hi” to Greg – and that’s a wonderful thing to say. Okay, now I have a clue as to the time at your end of the globe. Of course, Australia should be way ahead of every other part of the world. So the difference in our time zones is nine hours. Hmm. Oh my gosh… wow.. you are brave. Though I suppose if you know how to do it correctly, it becomes much less intimidating. Very bold. First time I handled one of these, I was alone. No one was there to tell me how, I just had to remember what that neighbour did. After that first time, though, I was fine, the fear went. but Allyson,,,arghhh, what to say? this post makes snake is easy to deal with. for me, even a tiny little snake would make me screaming out loud… -_-“! Bungee jumping! [Bungy? Not sure of the spelling]. I could not jump off a bridge with an elastic rope around my ankle. Parachuting might be marginally better, but the plane would have to be on fire. 🙂 Spiders aren’t too bad, but I don’t like webs, especially the big sticky ones you get in Australia. Wow, u overcame it nicely after reading expert books. it even makes it more amazing. Sama-sama, Yuna. 🙂 I’m sure you have many adventures that would make me very scared! You travel more boldly than I do for starters. owch, i never thought it before, my adventure would give that vibe to someone, but i’m pretty sure that’s a different scare 😀 :D.